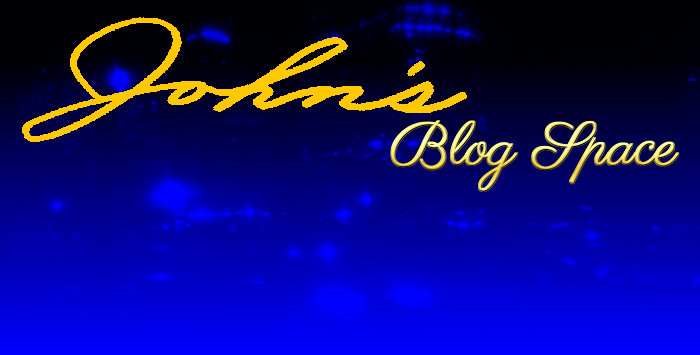 Welcome to John's Blog Space (JBS)! This page has been created so people can understand what exactly this blog is about. I have created this page to introduce my readers/subscribers to John's Blog Space. This specific page was created so that I can properly introduce people to my blog. It contains information on what this blog is basically about. Everything featured here is a personal overview of this blog in case people need to know what this blog is about. All of what I post on this page is completely true and legitimate. In case you are wondering what this blog is about, it is a personal blog about anything and everything. I mostly discuss things in a professional way and in a respectful way. I do NOT post blog entries just to unnerve or annoy people. Everything serves at least one purpose. Therefore, my blog posts offer value to various viewers and visitors. I use Adsense and Amazon Associates to monetize my work because I feel my material is of good use to others. So much so that I'd like to offer relevant material in my blog to my readers in case they are interested. This is NOT, and I repeat NOT- a commercial blog. I am not paid to post about ANYTHING or to make any kind of posts. I am my own boss and make my own posts whenever I feel like it. The primary point of blog posts is to express ideas. The secondary purpose is to offer material online from Amazon in case they are interested in purchasing items to enhance their experience of John's Blog Space. For more items concentrated on a certain topic, I have set up John's Shop Space (JSS), where I entirely focus my energy on items from Amazon to take some stress off of preparing blog posts while finding relevant items to readers. The one deterrent to this blog is that since I try to focus on multiple topics, people will think this is a blog that tries to be about every topic with no serious concentration. I don't believe in labels. If you have to label this blog, it is a personal blog because everything consists of my own commentary. I sometimes use (and credit) other sites in case I need some extra information or pictures from other sites. I want involvement and engagement from my visitors. As much as I have done to post material for the Internet, I would appreciate my visitors to share and comment on my material. Enjoy reading my material and visit any other material I post to help enhance the experience. I am all about talking about items followed by offering material to visitors in case they are interested in more content. Furthermore, I invite my visitors to please show their support for my material by visiting my many other sites. That includes my Facebook fan page, my YouTube channel, my FeedBurner RSS feed, following with Google FriendConnect, and more. I want people to please show their support of my work if they enjoy my reading. John's Blog Space regularly gets blog hits from about 15 to 20 different countries daily and over 160 nations all-time since keeping count. I get hits often times from multiple places such as North America, South America, the Caribbean, Europe, Africa, Asia, Australasia, and the South Pacific. According to Blogger/Blogspot statistics, my blog usually gets at least 2,500 blog hits daily (I used to get 3,000+ hits daily). I do not view my own blog just to up the hit count. I take no shortcuts to draw the attention and popularity to my blog. There is one thing you can be sure of- I am completely genuine in all of my content. I thank you for visiting my blog and reading its content. You now have a proper introduction to my blog and its content. Please enjoy my blog!